Don’t waste your money on CRM if … – Resolv Inc.
With 95% of the executives I speak to agreeing that CRM is so much more encompassing than software, how many of them truly believe it? How many of them actually spend the time to analyze their processes and people in relation to CRM? How many of them actually make a plan for incorporating CRM into the Process and Culture of their organization? Less than 5%! Most executives implement CRM, hold a couple of trainings and consider CRM to be implemented. When they hire a new person, they have an on-boarding session that includes a couple of hours of CRM training. My belief is that most of these companies have yet to realize the potential of CRM. Why? Because it is not engrained into their business. It is an after-thought. Can you imagine if an accounting system were an after-thought? Or if human resources were an after-thought? Both would be a miserable failures! 1) We don’t know how to do it. This is a viable excuse. Many companies would not know where to begin to fully intertwine CRM and their business processes and culture. Therefore, rather than pay more money for consulting on top of the tens-of-thousands they are paying for CRM software, they make a half-hearted attempt to do this internally. The effort usually dies off with increased resistance to change. 2) We are afraid of the disruption it will cause. Another good excuse. Implementing CRM in alignment with a company’s process and culture takes time. It takes time to understand the current process, and even more time to modify the process to include CRM. Let-alone the time it takes to analyze how implementing CRM will affect individuals in the organization. Companies usually implement CRM, train on its usage, and leave the process change up to individuals. 3) We don’t have the resources. The most honest of excuses. And not an uncommon one. It takes time, money and patience to implement a CRM system and integrate it into your company’s culture and process. 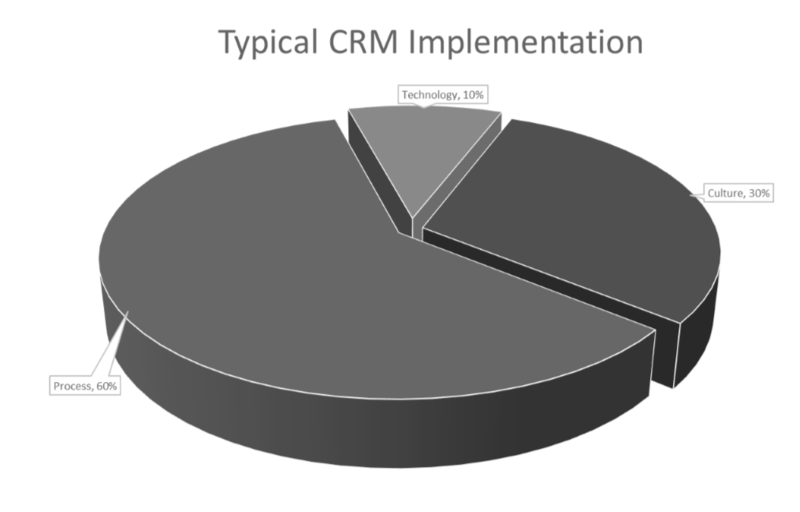 Therefore, many companies are satisfied with the minimal results offered though implementing non-integrated CRM, considering those results a win. Unfortunately, these small wins usually do not justify the expenses of a CRM system over the long term, and companies usually see the usage of CRM diminish over time. Usually to the point of it being a non-mission critical piece of software, with little or no relevance to the company’s performance. If you are planning to implement CRM, or re-implement CRM (for the second or third time), and are planning to gloss-over the importance of process and culture in your implementation my advice to you is simple: Save your money. Keep doing what you are doing now. Because that is basically what you will be doing with your new CRM system; you will be doing business-as-usual with one twist: You will be adding another task for people to perform. Let me conclude how I started, but complete the sentence: Don’t waste your time on CRM if you plan on CRM training being separate from process training. Done properly, there should be no CRM training. The training should be a natural part of process training. As you on-board new employees, they should learn all they need to learn about CRM from the process. Those steps in the process where they need to consume, update, or enter new data into CRM should be their training. And, when you reach this plateau in the world of CRM, you will never complain about CRM utilization or data accuracy again, because it will be a natural part of your company culture and processes. Do you agree? 95% of you probably will. But will your CRM usage reflect your agreement. Let me know your thoughts in the comments, or email me at lrussell@resolvcrm.com. I’d love to hear from you, and I’d love to chat with you sometime on how you plan to make CRM a vital part of your organization. I may even have an idea or two that will help.